South Portland Summer Farmers’ Market, 3-7 p.m. every Thursday, on Hinckley Drive, near Mill Creek Park. Scarborough Summerfest, 4-10 p.m., at the Clifford Mitchell Sports Complex, just behind Scarborough High School (For more details, see page 12). Kayaking on Casco Bay. Meet at Willard Beach at 8 a.m., return to Willard at 4 p.m. Kayaking around Casco Bay with stops at Fort Gorges and Peaks Island. Includes all equipment, instruction with a registered guide from Sea Spray Kayaking. Pack a lunch and drinks. Cost is $55 per person. www.southportland.org or 767-7650. Southern Maine Daylily and Hosta Society event, hosting guest speakers Kevin Walek and Michael Miller, at 10 a.m., at Southern Maine Community College, 2 Fort Road, South Portland, in the Jewett Building. There will be a silent auction and a public auction of Miller’s plants. Bean supper, 4:30-6 p.m., West Scarborough United Methodist Church, Route 1, Scarborough. Baked pea, kidney and vegetarian beans, red and brown hot dogs, American chop suey, cole slaw, gelatin salads, rolls, brown bread and pies. $8, $3. Tri for Preservation triathlon, in Cape Elizabeth, to benefit Cape Elizabeth Land Trust. For more information, go to capelandtrust.org/triathlon. Scarborough Farmers’ Market, 9 a.m.-1 p.m., town hall parking lot. Reins of Hope Charity Ride, to benefit of Riding To The Top Therapeutic Riding Center in Windham. Registration starts at 9:30 a.m. at Jimmy The Greeks at the Maine Mall in South Portland. The suggested donation is $20 per rider and $10 per passenger. To learn more contact Tammy Jones at tammy@customhawg.com. Fight Back Festival Happy Hour, 4-8 p.m., Sebago Brewing Co., 201 Southborough Drive, Scarborough. $1 from every beer purchase will be donated to Fight Back Festival, a bike, run and walk fundraiser for the Cancer Community Center. For more information, go to fightbackfestival.org. Maine Mall Farmers Market, 11 a.m.-3 p.m., on the corner of Gorham and Philbrook roads every Tuesday. Benefit concert, by the Gunther Brown Band to benefit Hope Acts/Friends of Burundi, 7-8 p.m., Thornton Heights United Methodist Church in South Portland. The church is located at 100 Westbrook St., South Portland. The phone number is 774-0487. 5K road race, by Knights of Columbus at St. Maximiliam Kolbe Parish in Scarborough. Registration starts at 5 p.m. at 150 Black Point Road, Scarborough. The race starts at 7 p.m. Food and drinks for racers are provided. Foir more information, contact Tony Myett at 272-7731. Beach breakfast summer book discussion, 8:30-10:30 a.m., at Kettle Cove beach in Cape Elizabeth, sponsored by Roman Catholic parishes. Breakfast will be provided. Bring a copy of the book and a lawn chair. In case of rain, the breakfast will be at St. Bartholomew’s. Registration is required. Contact either Sparda (883-1742 or Kathleen.Sparda@portlanddiocese.org) or Williamson (799-5528, ext. 102, or Kathy.Williamson@portlanddiocese.org) to register, or register online at www.saintbarts.com, www.saintmax.com, or www.hcsj.org. There is no fee. Bake and craft sale, 9 a.m.-2 p.m., Peoples United Methodist Church, 310 Broadway, South Portland. Baked goods, homemade jellies, handcrafted jewelry, knits, birdhouses and more. Bazaar and rummage sale, 9 a.m.-4 p.m., St. Maximilian Kolbe Parish, 150 Black Point Road, Scarborough. Multi-family yard sale, silent auction, Scarborough Police and Fire departments demonstrations, Fournier’s Karate, face painting, food and more. For tables available for rummage sale and vendors at $15/$20, call Lou Chabot at 883-4302. “Fresh from the Farm” dinner, at Broadturn Farm in Scarborough, 6-9 p.m. Fresh, organic vegetable and meat entrees prepared by master chefs at Aurora Provisions. To benefit Scarborough Land Trust’s Broadturn Farm Maintenance Fund. 289-1199 or info@scarboroughlandtrust.org. 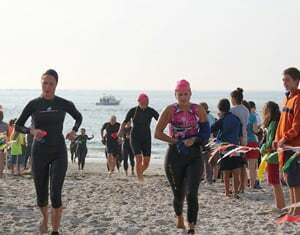 The Cape Elizabeth Land Trust Tri for Preservation takes place Sunday, Aug. 19, at Crescent Beach State Park.